Quality, efficiency and perfect performance meet head-on in this distinct studio upright. Rarely do you see such a combination of playability and durability, designed to meet the demanding needs of today’s versatile pianists. Baldwin’s commitment to the art of crafting quality vertical pianos has long been recognized by individuals who demand the best. Regardless of the genre, a Baldwin piano speaks the language of music with eloquence and passion. Golden tones ring with definition and authority. Keys respond to the most subtle command. 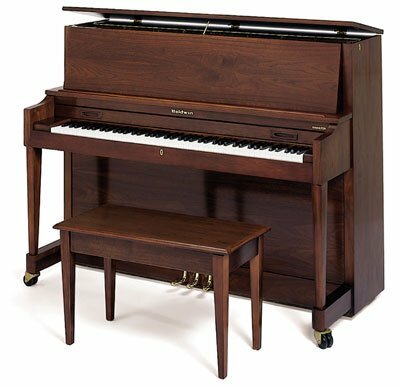 No matter which Baldwin you choose, you’ll own an instrument that is preferred by many of today’s finest pianists, composers, conductors , symphony orchestras and performance venues. Baldwin pianos feature solid construction reinforced backs constructed of the finest materials. This enhances both the structural attributes of the piano and its sound characteristics, helping to produce full, rich tone. Baldwin Pro Series bridges are constructed of solid maple. This design contributes to the sustaining tonal quality of the Baldwin piano. Ribs, crafted of premium spruce, are hand selected and matched to each soundboard for maximum stability. Baldwin strings provide consistently rich and detailed fundamental tones and harmonic overtones. 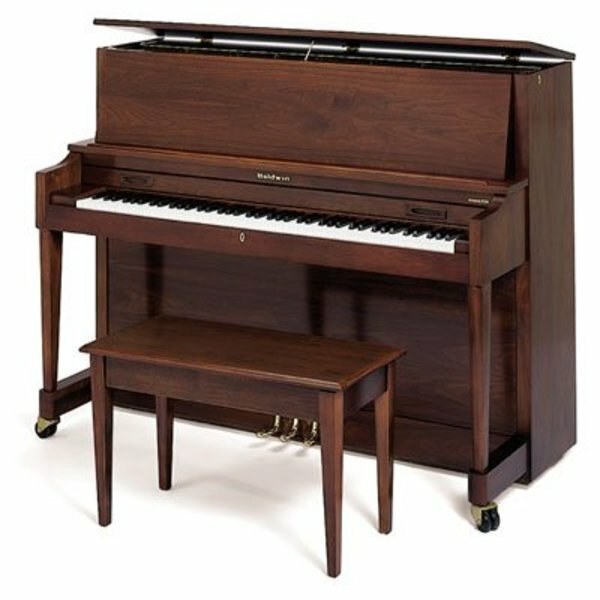 The Baldwin Pro Series piano pinblock consists of multiple plies of hardwoods. By alternating the grain direction of each ply, tuning pins are snugly held. Because the plies are joined with a waterproof adhesive, the integrity of the Baldwin grand pinblock is not adversely affected by humidity. Consisting of more than 7,500 parts, the Pro Series action features the exceptionally responsive touch that professional players prefer. Baldwin only uses premium hammers to ensure world-class, note-to-note consistency and excellent tonal range. Baldwin keybeds are constructed of cross-grained hardwoods. This design ensures long term dimensional stability. Baldwin keys feature all-hardwood reinforcement parts. Sharp keys have a refined radius for superb feel.